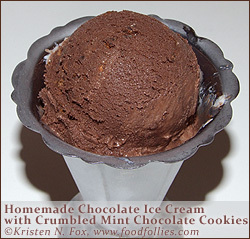 Our first homemade ice cream of the season – seriously chocolate ice cream with crumbled up chocolate-covered mint cookies! (You know, the kind sold by that national group of girls every spring? Yeah, them.) This is just our usual chocolate ice cream recipe with the cookies added, so I’m not including a how-to – just a how-delicious! It’s 85 degrees with 100 percent humidity. You happen to have a nice bunch of fresh kiwi fruits in the refrigerator. Do you just cut them up and eat them? 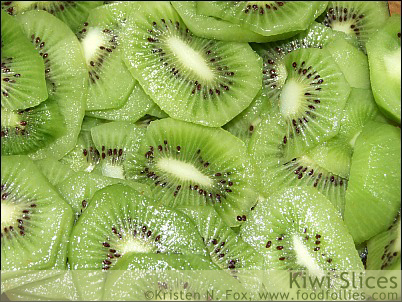 Cut your kiwi up into small pieces into a medium sized bowl. Sprinkle the lemon juice over it. Then sprinkle the sugar over it and mix it up a bit. Cover it and put it in the refrigerator for an hour. Pour it into your ice cream maker and follow manufacturer directions. Put in freezer! This Crumb Top Apple Pie recipe is just the thing if you don’t have enough apples to make a regular apple pie; the recipe originally called for three cups of sliced apples instead of the usual six cups. Of course, this recipe requires a lot more butter for the topping than the basic apple pie recipe too, but we actually HAD butter we needed to use up (long story involving a malfunctioning refrigerator) so it worked out for us. I started with the recipe from the The Complete Magnolia Bakery Cookbook and made a few changes – you can see our modified version below. And here’s the glorious outcome! The topping was nicely crisp, and since the apple filling layer is thinner, it’s not QUITE as much sticky-sweetness as a normal apple pie. I’d recommend eating it with a scoop of vanilla ice cream to round out all the flavors nicely. 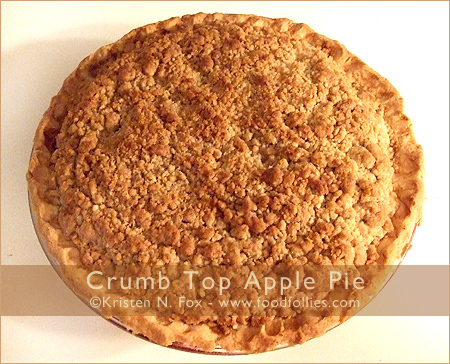 This pie is two equal depth layers – apples on the bottom and crumb topping on the top. Filling: In a large bowl, combine sugar, flour, cinnamon and nutmeg. Add the apple slices and mix gently until all of the apples are coated. Scoop the apple mixture into the pie crust. Topping: In a medium or large bowl, mix the flour and brown sugar together. in the pie pan – make sure it’s well covered. vanilla ice cream or whipped cream. 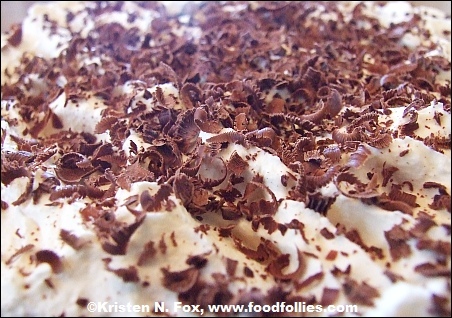 The other day I had just the right amount of the right ingredients to toss together a homemade chocolate cream pie – graham crackers and butter for the crust, instant pudding and milk for the filling, a cup of heavy cream for the whipped cream (with a bit of sugar), and a nice chunk of organic chocolate to shave on top. I love impulsive cookery when it works out! This design began with a really weird conversational tangent, became an Out of Context Quote, and then ended up on a t-shirt! Four+ days of hot, humid weather did not shine kindly upon the three bananas we had in the kitchen, but I didn’t realize that until I was half done making the batter for banana bread. The peels had only the usual amount of black and spots for ‘just’ overripe bananas, but the insides were unusable – bleh. After a quickly passing state of panic where I considered hightailing it to Canada and leaving the recipe remnants for the next person passing through the kitchen (probably the dog), I, instead, thought of what else I could make this bread into. I almost decided on applesauce bread since I spotted two apples in the fridge, but then, glowing like a beacon, with heavenly trumpets sounding, I saw them…. blueberries! Yes! Looks like it has a light crusty top, so that’s a good thing. And as soon as it’s cooled and I can take it out of the pan, the taste testing will begin! And continue on until it’s been tested into oblivion. Contrary to some beliefs, ice cream DOES taste just as good in winter as it does in summer – you just have to put on a sweater when you’re eating it. 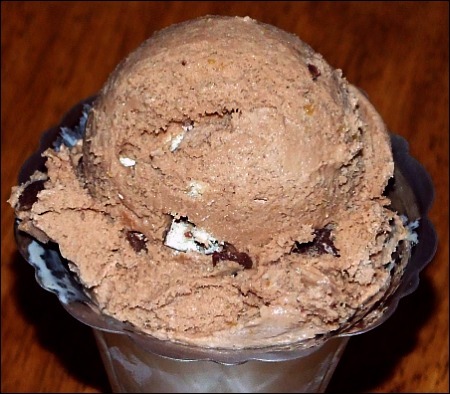 😉 That’s the justification for the impulse I had to make some malted milk ball ice cream – it’s thin, but whatever works. I made a custard base with cocoa and chocolate malt powder – the malt gives it a smooth consistency and the unique malt flavor, and the cocoa gives it a little more chocolatey solidity. After churning, I tossed in the cut up malt balls (whoppers) and froze it. It was really smooth and delicious. The malt powder prevented it from getting as hard/solid as regular chocolate can, which worked out nicely. I had a bunch of cranberries sitting in the fridge, and didn’t want to make just another cranberry-orange bread, as delicious as those are. 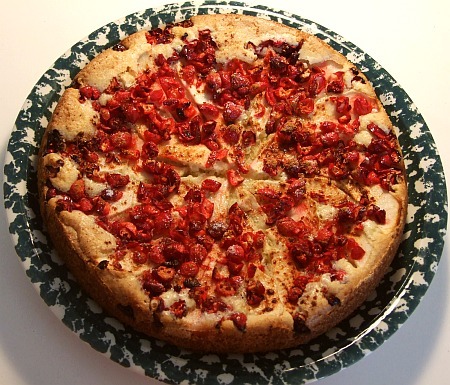 Luckily, we got the baking book from the Magnolia Bakery as a thoughtful holiday gift, so I looked up ‘cranberries’ in the index and found this torte recipe! The recipe called for pear slices and cranberries, but we had apples so I substituted apple for the pear. 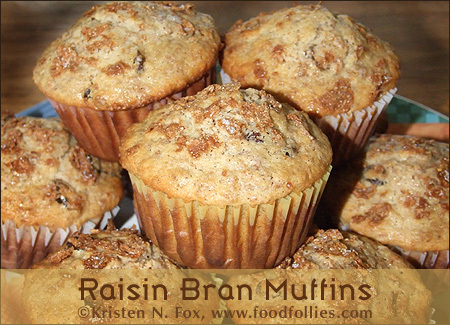 It came out terrific – unsurprisingly, just like a coffee cake with fruit, topped with a crunchy but subtle sugar topping that gave it that little extra oomph. I know, in this picture it looks like a pizza, since I baked it in a round springform pan and not one of those ‘torte’ pans with the fancy wavy edge, but trust me, it’s definitely NOT a pizza – LOL! Looking forward to trying more recipes from this book. Upstate New York is having a great blueberry season, and having picked up a lovely pint of local blueberries, I decided to make some blueberry swirl ice cream! First, I washed all the blueberries and tossed them into the blender. 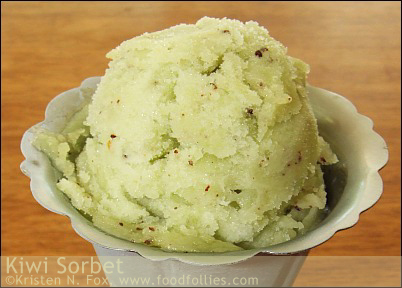 I added about a 1/2 cup of sugar and a few tablespoons of lemon juice, and hit puree. Then I poured the puree into a saucepan and cooked it down for a while to make a concentrated reduction sauce. After that, I poured it into a bowl with a lid and cooled it down in the fridge. The ice cream itself was just a basic vanilla I made in my ice cream maker. 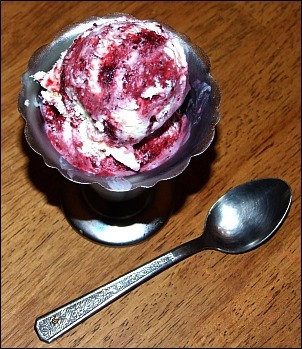 When I’d churned and frozen it until it was soft serve consistency, I poured half of it in the bottom of the storage container, then poured half the blueberry puree over it, then more ice cream, and then puree to finish it off. I ran a knife through the mixture to swirl the blueberry into the ice cream, enough to create a good swirl mix, but not enough so it blended in too much. Then, froze it all overnight so it would solidify. And let me tell you, it was fan-tastic! 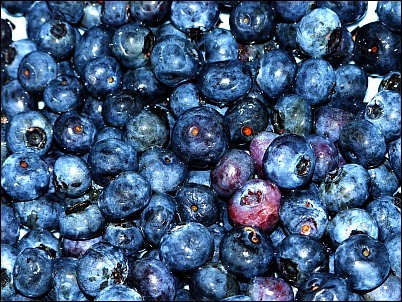 The blueberries were SO sweet and flavorful, and even in the colder temperatures of the ice cream they were delicious and well, vibrant seems to be a good word for it. 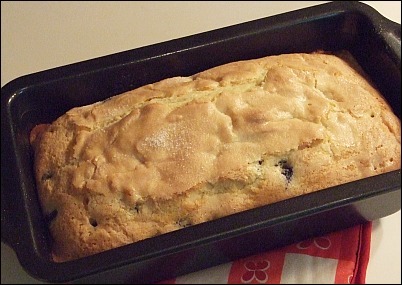 Oh, I also took a photo of the blueberries before they were pureed….